LEXINGTON, Ky. (AP) – A larger-than-life bronze memorial to the famous racehorse Secretariat is coming to Lexington this fall. 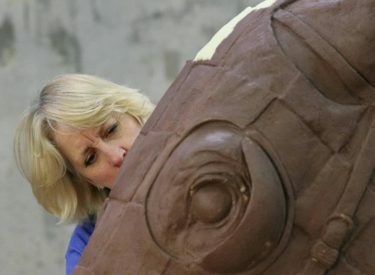 The Lexington Herald-Leader reports sculptor Jocelyn Russell is constructing a statue of the 1973 Triple Crown winner. He’ll be posed in full stride winning the Kentucky Derby as starter no. 1A, with jockey Ron Turcotte in the saddle. Russell spent six months researching Secretariat before creating a design. Once completed, the statue will travel from her Norman, Oklahoma, studio to its permanent home in Lexington at the intersection of Alexandria Drive and Old Frankfort Pike. A parking and viewing area nearby will have informational kiosks. The statue is being funded by the private Triangle Foundation while the parking and viewing area is funded with a combination of local, state, and federal money.